The owners of this property requested a pool and tropical plants. The pool was placed off to one side to leave room for a fire pit and small lawn. The raised spa is clad with a stone veneer and capped with travertine coping. 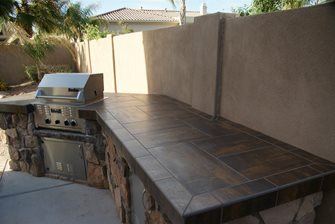 The existing barbecue was remodeled to match the materials used for the pool. 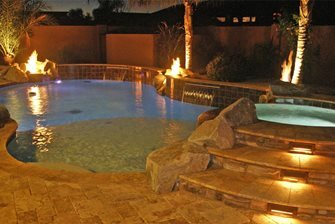 At night dramatic fire features along the edge of the pool can be turned on. Lighting was crucial for making the most of the patio after the heat of the day has passed. 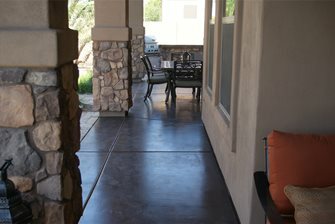 The existing concrete was stained to enhance its appearance. A variety of palms were planted to enhance the tropical atmosphere. Flowering plants such as hibiscus add color to the landscape. 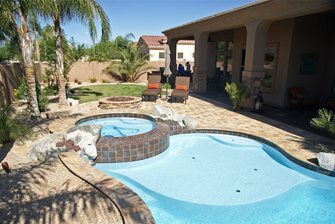 Now the homeowners have their own private oasis that they can enjoy with friends and family. 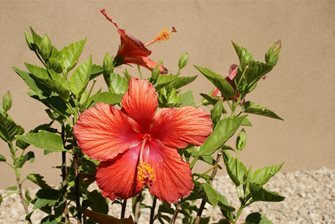 At the mention of Arizona, most people think of hot weather. 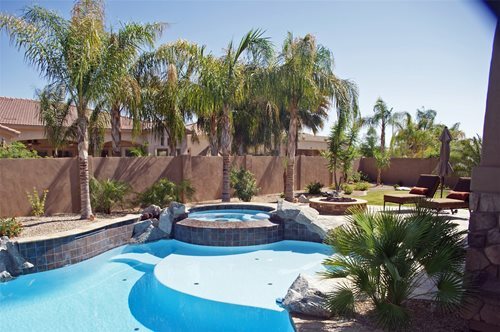 With local summer averages of 106°F, these homeowners decided to create a mini oasis in their own backyard. They already had a covered patio and built-in barbecue, but they wanted to add a swimming pool and amp up the tropical atmosphere. They found Alexon Design Group through a good old-fashioned print ad. "We beat out three other companies who bid on the project," says company owner TJ Wilcoxson. The couple who owns this property is in their late thirties and has two small terriers. They wanted a space where they could relax and entertain outdoors. "We designed the project according to the Spanish Colonial architecture of the home and the client's high-end tastes," explains Wilcoxson. Backyard size: 3,600 sq. ft.
One of the challenges of this project was arranging all the elements in a fairly small backyard. The pool was placed off to one side to leave room for a fire pit, sundeck and small lawn for the dogs. The existing barbecue is located up against the wall on the opposite end of the yard, and covered patio space is integrated into the design of the home. "For the construction of the pool, we actually had fairly good access," Wilcoxson recalls. A small Bobcat was used for the excavation. The swimming pool is the focal point of this landscape. 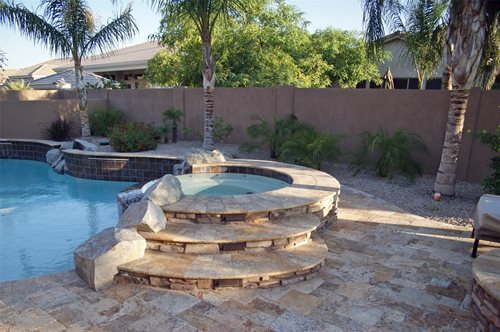 It has a free-form design and features a raised spa with a spillway and a baja shelf. The organic shape of the pool helps to soften the rectangular footprint of the yard. A pair of water features spill out from a raised wall along the back side of the pool. 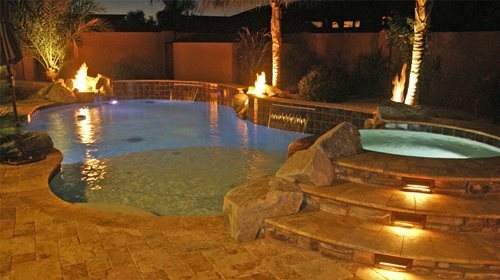 However, the most eye catching aspect of this pool is the three fire features. "Four men hand set these features 6" below the bond beam of the pool shell as it was drying," explains Wilcoxson. Gas lines were installed at the proper height before setting the boulders in place. 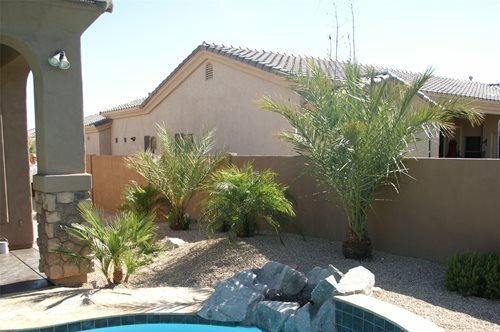 To avoid creating a distracting eyesore behind the pool, the equipment was hidden behind a wall stuccoed and painted to match the existing walls. 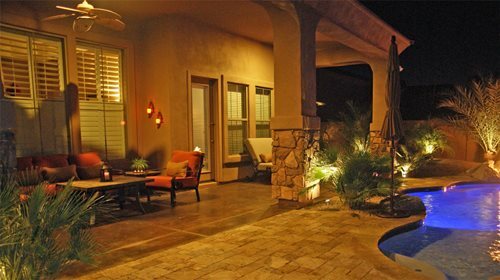 Because nights are often the most comfortable time to enjoy the outdoors in Chandler, Alexon included a fire pit and dramatic lighting. The round fire pit, which was constructed with masonry block, a stacked stone veneer and bullnose travertine caps, echoes the shape of the raised spa. Strategically placed uplighting highlights the palm trees, while tread lights add a soft glow around the spa. The owner also uses lanterns and candles to light the seating areas on the patio. A variety of different hardscape materials were used on this project. For the pool deck paving, Alexon installed pavers. 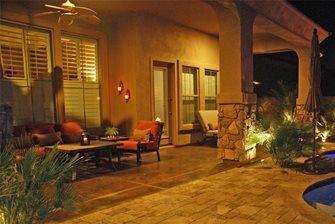 "We used Mexican Scabos, which are tumbled travertine pavers with natural color variations," says Wilcoxson. The existing concrete patios near the house were colored with and English Leather acid stain. The option of installing pavers over the existing patio was declined because of elevation and budget issues. "It was much easier to lay the pool deck pavers at the same elevation as the existing patios than it would have been to pave over the concrete and raise the elevation of the pool deck to match," Wilcoxson explains. He also notes that this choice saved the homeowners $4,000. Materials used for refurbishing the barbecue included stone veneer to match the house and porcelain tile that coordinates with the stained concrete. Both new and existing palm trees add to the tropical atmosphere of this backyard. The taller Queen Palms along the back wall were already on the property when Alexon was hired to transform the backyard. They decided to bring in a variety of other palms to further enhance the tropical feel. Particularly, the large Pineapple Palms provide big impact. Wilcoxson recommends selecting small, low-maintenance palm trees that can be trimmed without climbing gear or a lift. 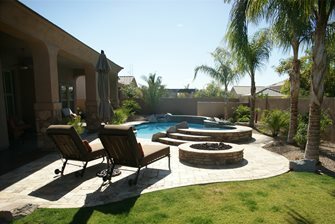 "Palm trees were a good option for this yard because they have shallow roots that don't spread," he explains, "this made it possible to place them near the walls, pool and patio without worrying about their roots causing damage." In the end these homeowners got a great spot to relax outdoors and escape from the Arizona heat. Their friends and family will have no problem accepting invitations to barbecues; in fact, they may even invite themselves.